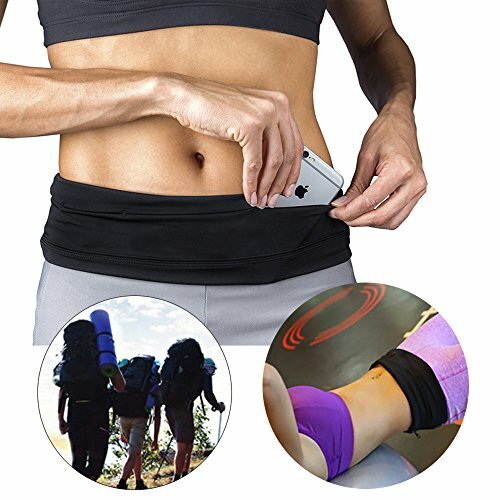 The Gear Beast Running Waist Pack allows you to take your Apple iPhone, Samsung Galaxy or other Smartphone, as well as other items, with you while running, hiking, jogging, walking, cycling or working out. Made from Spandex, the unique bounce-free design keeps the pouch from moving during activity. Running Belt & Fitness Workout Belt Waist Pack will prove to be a good choice as well as it prioritizes your convenience. Even if you are not running, this can still prove to be functional. You can bring it with you when you are traveling as it can fit a passport. It is machine washable /dryable. Soft and Comfortable - fitness belt is made of high-quality Polyester/spandex fabric, for moisture wicking, quick drying, stretch and softness against your skin, no buckles no zippers to cause uncomfortable chafing. Fashionable - Wear it outside or hidden (underneath your clothing) is both ok, barely noticeable belt that matches to your outfit and still gives quick access to your essentials. FASHION AND USER-FRIENDLY DESIGN: It's not only a Running Belt, but also a chic and stylish Travel Money Belt. It comes with smartphone pocket specially, and also a pocket with a key buckle, furthermore there are 4 pockets. MULTI-SIZE: The 6 INCH width is twice as wide as Flipbelt and other best selling running belts, Fits smart phones: iPhone 7/6 plus, Samsung Galaxy Note 4. S/M/X/XL sizes for your choices. If you have any questions about this product by emall, contact us by completing and submitting the form below. If you are looking for a specif part number, please include it with your message.